The other night I made a mitten for Davey. It knit up really fast. I made it while we were watching a movie. I held it up for David to see, and he immediately said that it would be too small. I guess I am in denial as to Davey’s size. David was right. Davey could squeeze it onto his hand, but that’s about it. I guess it is apparent that the blue mitten was my first attempt. I need to knit the second one and send to my little cousin George. They should fit him in the next year or two! 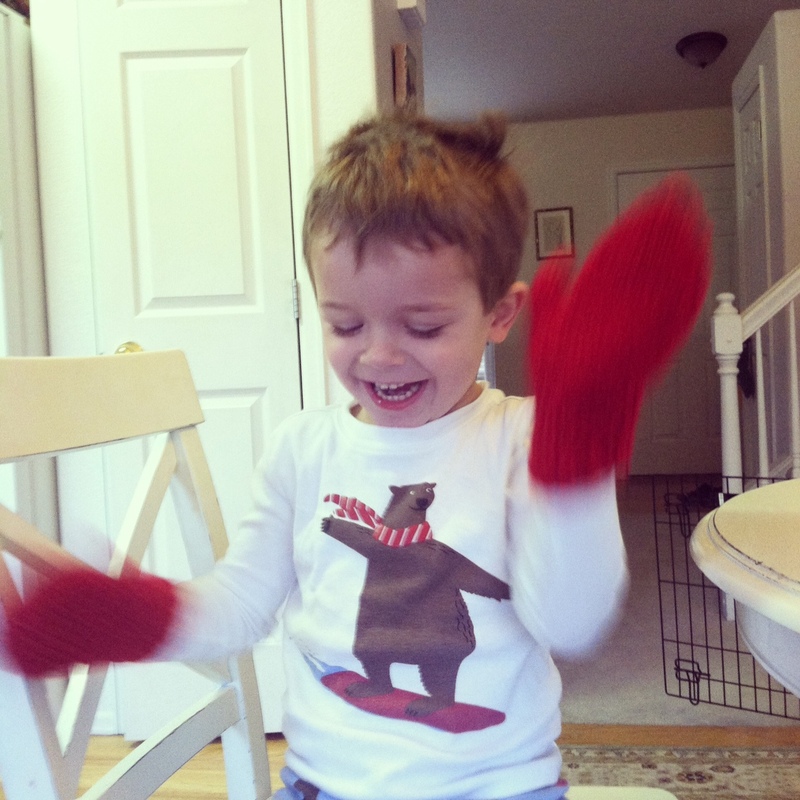 It turned out ok because Davey really wanted red mittens anyway. So I made him some red ones. They are actually just a little big, but he really likes them. This picture is blurry, but I like Davey’s grin and the way he is showing the mittens. Guess who is making him laugh here? Yep. Buster. Buster keeps Davey laughing! So I used a Lion brand easy mitten pattern for the red mittens. I had used a pattern from redheart.com for the blue mitten. I didn’t check gauge (obviously), and so what I thought should have fit – didn’t. 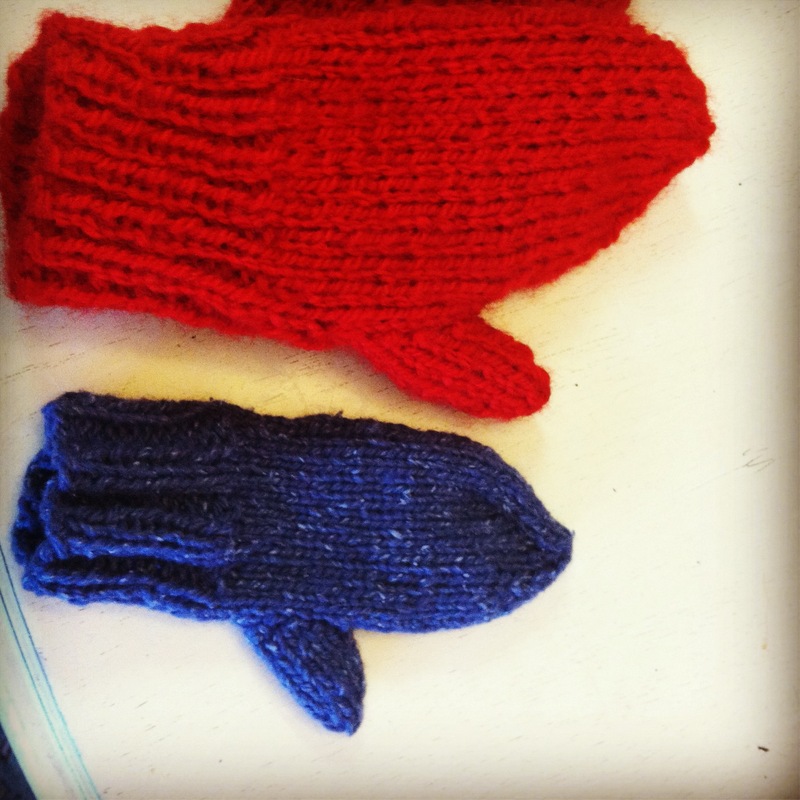 I liked the blue mitten pattern though because I used dpns and knit them in the round. I was hesitant to use the Lion brand pattern, because you knit them flat and then seam them up. I thought – why in the world would I knit something flat that is circular when I could knit in the round? But I thought I’d give them a try. Turns out, I really liked the pattern a lot! The mittens are small so the seaming went really quickly. I’ll definitely make these again. It’s been so darn cold here that I think I may have to knit some for me today! 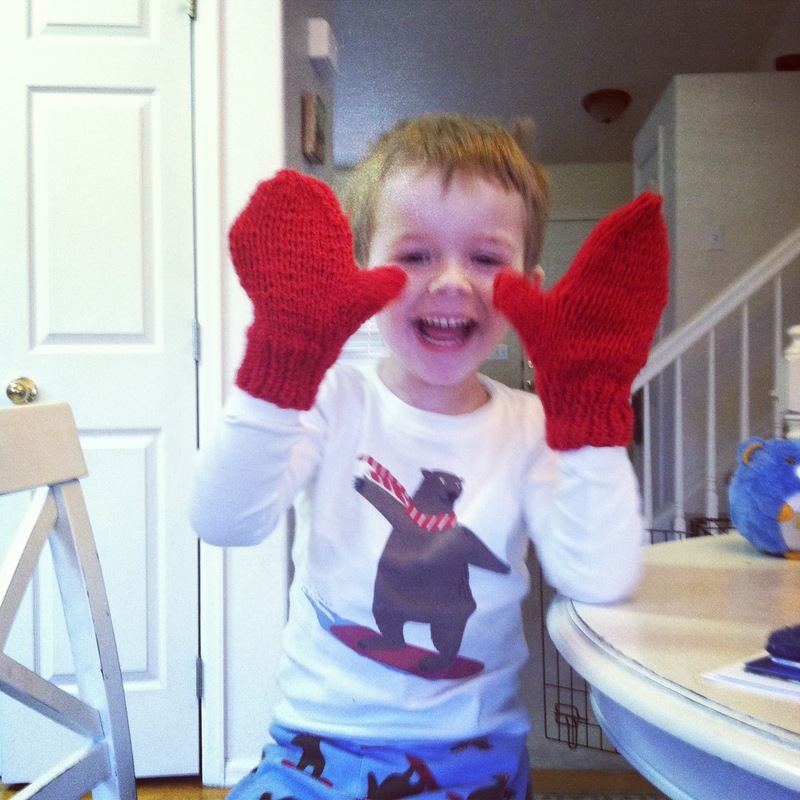 This entry was posted in Knitting and tagged Lion Brand Easy-Knit Mittens, mittens by cpeezers. Bookmark the permalink.